With the help of the former Dundalk star, Rotherham United secured promotion to the Championship. Rotherham United's Richie Towell evades Alex Rodman of Shrewsbury Town during Sunday's League One play-off final. RICHIE TOWELL HAS expressed his interest in remaining at Rotherham United after helping the club to achieve promotion back to the English Championship. 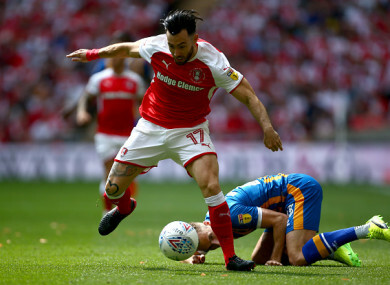 The 26-year-old attacking midfielder played all 120 minutes as Rotherham recorded a 2-1 win over Shrewsbury Town after extra-time in Sunday’s League One play-off final at Wembley. After spending the season on loan with the Millers, Towell is due to report back to parent club Brighton & Hove Albion for pre-season training next month. However, having made just five first-team appearances in 18 months with Brighton — who finished 15th in the Premier League this season — Towell would be likely to face an uphill battle to force his way into manager Chris Hughton’s plans. The former Celtic and Hibernian midfielder is keen to play for Rotherham when they return to the second tier of English football, but he admits the decision won’t be his to make. “I am going back to Brighton on 28 June, which is not the longest break for me, but it is part and parcel of being a professional footballer,” Towell said. “I will just go back there, do pre-season and literally just wait to see what they say to me. Towell joined Brighton from Dundalk in January 2016 after winning every major honour in Irish football during three seasons with the Lilywhites. He was also named PFAI Player of the Year for the 2015 season, during which he netted 29 times. Email “Towell 'would love' to extend loan from Brighton following Wembley success”. Feedback on “Towell 'would love' to extend loan from Brighton following Wembley success”.